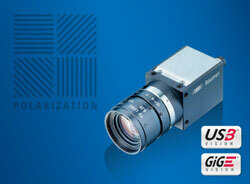 The new CMOS-based CX series polarization cameras with GigE and USB 3.0 by Baumer, uses the polarization properties of light and thus allows a wide range of new industrial image processing applications, e.g. for quality control in glass production, carbon fiber fabric (CFRP) or reflective surfaces. The cameras use the 5 Megapixel IMX250MZR global shutter sensor by Sony which has an additional polarization layer consisting of four polarization filters (0°, 90°, 45°, 135°) at the pixel level. A single image is sufficient to simultaneously determine the degree and angle of polarization of the polarized light without changing the filter. Thanks to the effective interaction between the integrated evaluation algorithm and the Baumer GAPI SDK, only the polarization information is transmitted. Applications can therefore be solved inline and be implemented flexibly, easily and cost-effectively. The series production of the new cameras will start in the 4th quarter of 2018. With the CX polarization cameras, physical material properties not detectable by the human eye can be visualized and evaluated in order to optimize manufacturing processes, reduce rejects or improve quality. So they are of great value in the glass industry during the quality assurance phase in the production of glass articles such as bottles or ampoules. Thanks to their ability to capture the complete linear polarization state any mechanical residual stress that increases instability and the risk of breakage, will be reliably detected. These cameras can also be of benefit to the production process of carbon fiber fabrics for the automotive or aviation industries. The low-reflective, poor-contrasting carbon fibers are highly polarizing, which is why the grain of the fabric, the decisive factor influencing the stability of the material, can be inspected efficiently. An angular resolution of 1° is achieved by factory calibration of polarization. This means that the slightest deviations in the grain can be detected. The new CX cameras excel even when inspecting reflective or shiny surfaces such as metal. By selecting a polarization direction, glossy effects can be reduced effectively, e.g. to better identify scratches or to be able to read codes reliably.